The Big Bloggiversary Celebration has ended, but I don’t want you to go away empty handed. 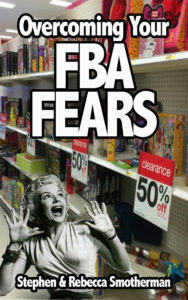 FREE BOOK – Our first ever Kindle book, Overcoming Your FBA Fears, is now available as a free download. This book currently has over 85 reviews with an average star rating of 4.8 out of 5 stars. We’re really pleased with how well this book has been received by the reselling community. You can download this book for free right now. The above book is a free Kindle download. If you don’t have a Kindle, you can still read the book on one of many free Kindle reader apps. Kindle makes free reader apps for your PC, Mac, smartphone, tablet, and more! To get a free download of the Kindle reader app, click here. Finally, I want to thank you from the bottom of my heart for joining Rebecca and I on this Full-Time FBA journey. 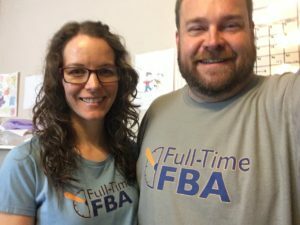 We both look forward to many more years filled with helpful articles, new books, videos, and – especially – hearing from you about how you are able to turn part-time hours into a full-time income via Amazon FBA. Copyright © 2018 Full-Time FBA. All rights reserved. Get weekly tips and tricks on how to succeed as an Amazon seller - Subscribe for FREE today. Get weekly success tips on how to succeed as an Amazon seller - Subscribe for FREE today.